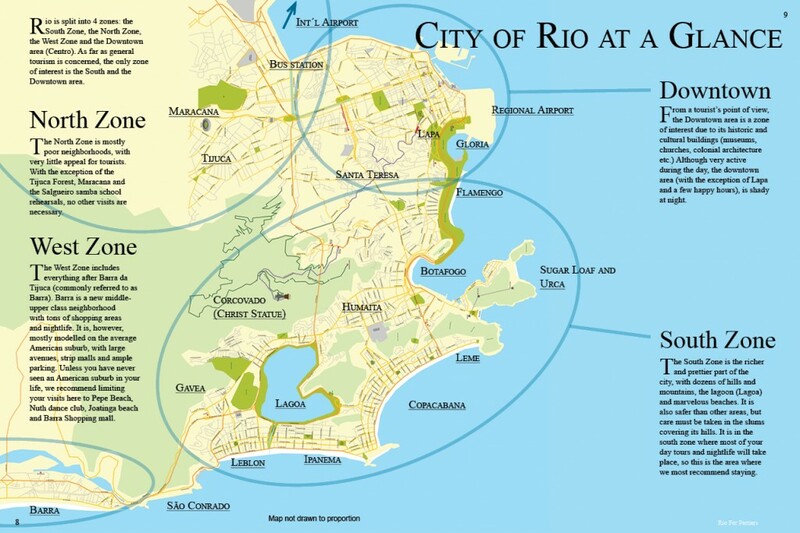 Rio is split into 4 zones: the South Zone, the North Zone, the West Zone and the Downtown area (Centro). As far as general tourism is concerned, the only zone of interest is the South and the Downtown area. The South Zone is the richer and prettier part of the city, with dozens of hills and mountains, the lagoon (Lagoa) and marvelous beaches. It is also safer than other areas, but care must be taken in the slums covering its hills. It is in the south zone where most of your day tours and nightlife will take place, so this is the area where we most recommend staying. The North Zone is mostly poor neighborhoods, with very little appeal for tourists. With the exception of the Tijuca Forest, Maracana and the Salgueiro samba school rehearsals, no other visits are necessary. 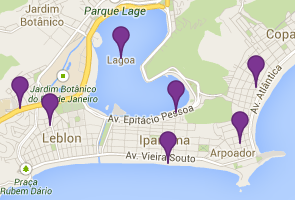 The West Zone includes everything after Barra da Tijuca (commonly referred to as Barra). Barra is a new middle-upper class neighborhood with tons of shopping areas and nightlife. It is, however, mostly modelled on the average American suburb, with large avenues, strip malls and ample parking. Unless you have never seen an American suburb in your life, we recommend limiting your visits here to Pepe Beach, Nuth dance club, Joatinga beach and Barra Shopping mall. From a tourist’s point of view, the Downtown area is a zone of interest due to its historic and cultural buildings (museums, churches, colonial architecture etc.) Although very active during the day, the downtown area (with the exception of Lapa and a few happy hours), is shady at night.